It has been said, “The roadsides may become the last open spaces that we have. We view our world now through the windshield. The roadside is a reflection of who we are.” Why not keep these threads of beauty as they once were? No need to litter them with exotic plants from Europe, South America or Africa. 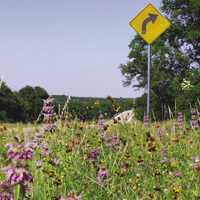 Offered for everyone who would like to keep our land beautiful, the Texas/Oklahoma Native Roadside Mix gives you only 100% native wildflowers. Just the right mixture of annuals and perennials for quick establishment and sustainable plantings. Low to medium heights of mature plants allow good visibility over the top of the plants. Allow plants to reseed before mowing for year-after-year native blooms.